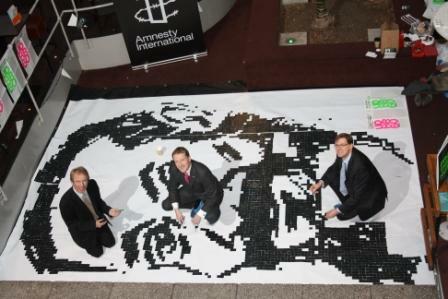 John Barrett MP joined Amnesty International today at Edinburgh University to help create a mosaic of Binayek Sen, an Indian doctor who is currently in prison and still awaiting a trial and details of politically motivated charges after over two years of waiting. John Barrett, who has been an Amnesty supporter for many years, called on the Indian Government to make sure justice is delivered in this case. John was joined by Tavish Scott MSP and Mike Crockart.